The Tubex Standard (73-105mm dia)Tree Shelter Guard and Stake Packages offers a great tree planting protection kit which is the ideal solution to providing protection from animals, to young trees during their most vulnerable stage. The Tubex Standard (73-105mm dia)Tree Shelter Guard and Stake Packages from Green-tech offers the Tubex Standard tree shelter and high quality wood support stake and ties to secure the tree tube shelter from being blown over or pushed over. The Tubex Standard Tree Shelter Guard provides an improved micro-climate for trees when tree planting, which results in better initial established and higher survival rates. This phenomenon allow for the planting of smaller tree, which are cheaper to plant and easier to source, and which ultimately lead to better tree with stronger roots. 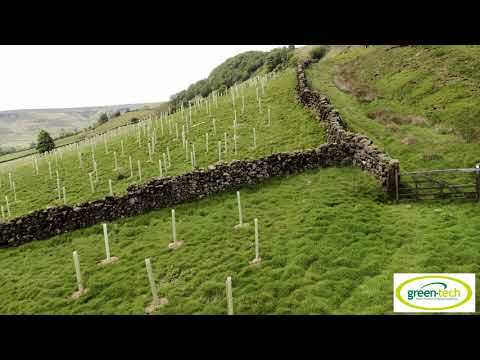 Ideal for protecting growing trees from damage against rabbits, hares, livestock and deer. The Tubex Standard Tree Shelter Tube also offer a great solution to allow for herbicide weed killer to be sprayed around the base of the tree and preventing the spray from contact with the newly establish planted tree in spring and summer when spraying.